TVD confessions. . Wallpaper and background images in the The Vampire Diaries TV ipakita club tagged: the vampire diaries all characters confessions. 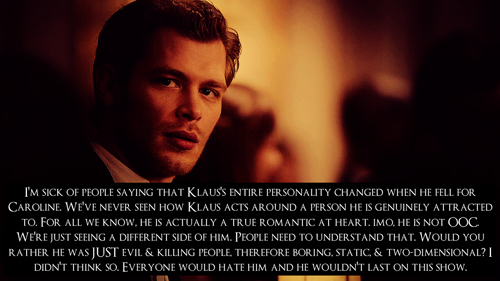 && Klaus has showed emotion, he cares for his family so much. Though he showed it in a bad way by keeping them all asleep for so long, he thought he was doing it for them. There's more to a person than just one side.